The Double Delight Bracelet and Earring kit is a beautiful combination of jump rings and crystals in a chainmaille weave. Notice how I have made the bracelet so that it can be adjustable in length. This makes it perfect for gift giving, as it will fit anyone's wrist. You could choose to make it a fixed length if you so desire. The crystals add a beautiful touch of "bling" to the chain. The picture shows a necklace that you could also make, but the necklace is not included in the kit. 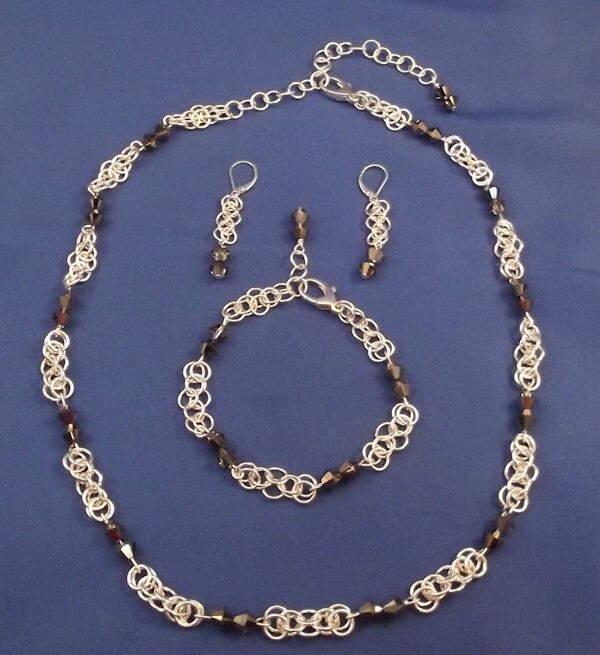 If you would like to make the necklace, order three of the bracelet kits. The kit contains jump rings for the bracelet and earrings and you supply the crystals, wire for attaching the crystals, earring findings and the clasp. This is a beginner project.